This is the first segment of a three-part review of the Springfield XD-S in .45 ACP. There are other online and magazine reviews of the XDS, so I wanted to approach mine from a different perspective, namely adoption of the XDS into a daily carry routine from the perspective of a Glock owner. I own both a gen-4 G71 and gen-4 G31. The G17 is used for occasional plinking at the range and I have a carbine conversion kit that uses the lower for whenever I want to practice shooting rifle. The G31 is a regular in several carry configurations, but primarily for when I’m on the road or outdoors hiking. The combination of extended barrel and full-size, double-stack mag means that it is typically reserved for shoulder carry in my Air Marshal 3 rig. I really wanted more of an all-around concealment option, particularly for general urban environments. Touching off an Underwood 125 gr. Gold Dot at nearly 1600 fps in a mall or a parking lot fills me with a bit of trepidation. High-penetrating Barnes-X rounds at over 1350 fps raises the nervousness level even more. For urban CQB I tend to prefer the .45 ACP round. As a Glock owner, the G36 immediately came to mind, however, I was quite enamored at the ultra-thin profile of the XDS. I’ve heard nothing but good things from Springfield owners and I’m the type of person that want to master shooting different rounds and firearms from different manufacturers. So, while I’m a Glock owner, I’m not a fanboy. I tested the XD-M compact .45 at the range and it felt quite good. So, I decided to handle an XDS at a gun show and it felt surprisingly comfortable. Well, you know what happened next. In addition to the firearm, I also purchased two +2 mags. This brings the capacity to 7+1 and 7, so I have a total of 15 rounds of .45 in a highly concealable package (even with the added height of the extended mag). I wanted to break this review into three sections, first impressions (brining the gun home), shooting, and daily carry. So, let’s look at what comes in the box. It’s noticeably larger than a Glock box simply because you get more stuff with your purchase. The pic below also shows the two extended mags. A Gen-4 Glock comes with three standard-capacity mags. 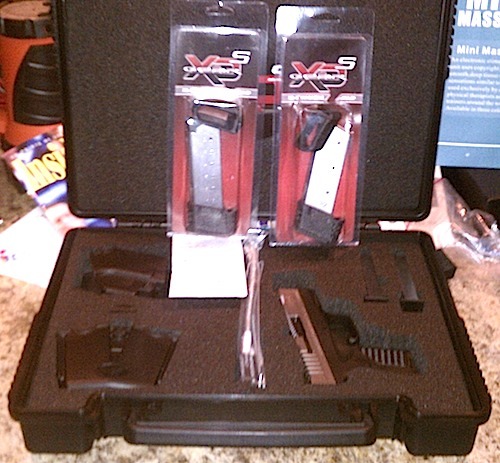 The XDS comes with two, both are five-round capacity. The most notable additions to the Springfield package are the OWB paddle holster and the mag carrier. Now, I don’t use the holster for daily carry, but I can imagine training situations where the class may require an IWB or OWB holster. If so, I’m covered right from day one. I found the mag carriers to be a bit difficult to use at first (a bit sticky), especially since they require extracting mags at an angle, instead of straight up. It does take some practice to gain familiarity, so I’d probably use this at the range or in a training scenario where I wanted to carry several mags. The obvious question is why a two-mag carrier when you have one in the magwell and one in reserve? Perhaps Springfield wants to encourage you to purchase an extra mag for three total? You do pay a premium over a comparable Glock for this packaging, so I’d kind of prefer three mags. Still, the gesture of trying to give you something to get started with carry and range use is appreciated. 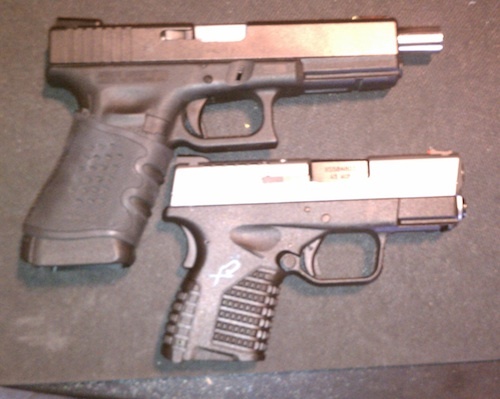 So, let’s get the firearm out of the box and see how it compares to my full-size Glock. This one is a bit more interesting. With the +2 mag, the XDS is the same height as the G31, however, the tendency to print is far less due to the exceptional thinness of the XDS (more on that in part III). The XDS has a three-stage safety, two of which are familiar to Glock owners (trigger and firing pin). The grip safety is different and I actually like this feature on a concealment weapon that fits into potentially tight spaces. Both the Glock and XDS have LCI’s, but the one on the Glock is a joke. The XDS LCI is located on top and is easy to check both visually and by feel. I still check all my guns old-school so I really don’t care, but this feature definitely favors the XDS. Another difference is the ambidextrous mag release in the XDS. It’s very near the trigger guard and you could even use the first finger of your right hand to release a mag if you could concoct a reason why anyone would want to do so 🙂 It’s a MUCH tighter release than my Glock and took a bit of getting used to. Also, since it’s a much smaller pistol, all the controls are bunched more closely together. It will take a bit of practice to move back and forth between the two pistols and work the controls with equal ease (a task I’m rather enjoying right now). The other item of comparison that is immediately noticeable is the sights. I have night sights on the rear and a fiber-optic on the front of my G31. Those are aftermarket. The FO front comes standard with the XD-S and I found the sights to be quite adequate right out of the box (you even get replacement green and red fibers, standard). 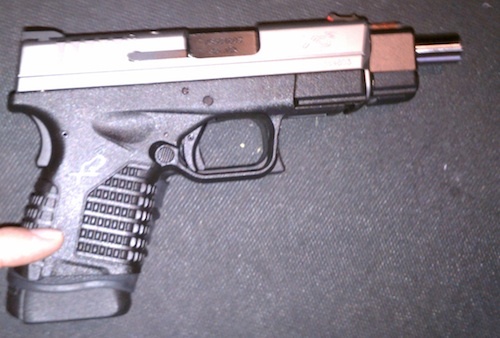 For night-time use, I always carry a flashlight, so I felt no immediate need to have night sights on the XDS. In addition to changing sights, it’s pretty common to swap out the connector on a new Glock then after a couple hundred rounds or so, get a trigger polish. I’ll get to the trigger more in part II of the review, but found it to be quite reasonable from the very first shot. I really only made one change to the firearm and that was to wrap the grip to build it up just a little. You may notice the Pachmayr grip sleeve on my G31. After shooting more than 50 full-on .357 Sig loads, I noticed the rough gen-4 texture started to rub against the top of the web of my hand. It left a pretty noticeable red spot by the end of a practice session. The grip sleeve eliminated that and I liked the thicker feel. Because of this, the first thing I did with my .44 mag revolver is wrap the grip with tennis grip tape. As a tennis player, this gives me a familiar feel that remains constant regardless of temperature or hand moisture. Over time, the tape conforms to the precise contours of your hand, providing an individually customized grip. I decided to try the same thing with the XDS and I’m surprised at how well it worked. The gun just feels better with the enhanced grip thickness and it provides natural finger grooves that more closely resemble the corresponding Glock grip. It does look different, but I really don’t care about looks with a SD pistol. If you prefer a more traditional approach, you can use the interchangeable backstops that come with the XDS. What about field stripping? 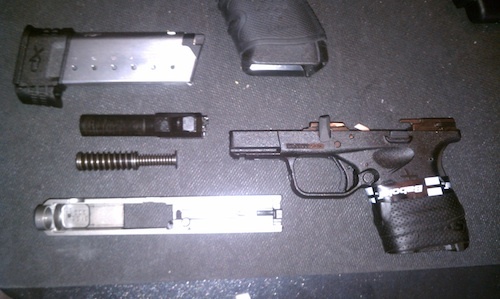 Now, nothing breaks down quicker and reassembles easier than a Glock. The XDS is pretty close. Here’s what a field-stripped XDS looks like (sorry for the poor-quality phone camera photo). You can see the Babolat grip tape (it does not interfere with the grip safety). You can also get a better idea of the relative size of the +2 mag. Glock owners will find the breakdown and reassemble process to be familiar with the only significant differences being the use of a takedown lever and dry-fire after adjusting the lever instead of before removing the slide. In the safety department, I liked the fact that Springfield incorporated a ‘fail safe disassembly’ feature into the firearm. The takedown level can not be operated with a mag loaded into the pistol. Now, don’t you just love that fully captured guide rod and dual recoil spring? Cleaning, lubing (no need for that extra drop on the connector), and reassemble is a breeze. The balance of the pistol is excellent and I don’t have any aiming issues moving back and forth between the Glock. I’ve put almost 500 rounds downrange with the XDS and I’ll cover my experiences with shooting the pistol in the second part of the review.